I’ve known Michelle Higgins for about 20 years. We were in the youth group together at New City Fellowship (PCA) in Chattanooga. We also attended Chattanooga Christian School together where we both sang in the choir and even performed in a stage adaptation of “Pride and Prejudice” together. (I was Mr. Darcy and Michelle was the mother, “Mrs. Bennett.”) Later, in college, we were ministry interns at that same church for a summer where we had some crazy times learning about how to love and serve as church staff. Later, we were able to hang out again when she and her family relocated back to St Louis where I currently live. Michelle came here to get her MDiv from Covenant Theological Seminary, the denominational seminary of the Presbyterian Church in America. Since then, we’ve been able to collaborate on a number of events and our churches, New City Fellowship in St Louis (PCA) and South City Church (PCA) have been able to grow together as sister congregations in our presbytery. I finally got to watch her talk this morning (I’ve been chasing my kids around, gimme a break) and I want to say that I personally endorse and support everything she said. I know she’s getting flack about what was said about adoption/abortion, and I want to say a hearty “AMEN” about her comments. I am now an adoptive parent and I have been a foster parent of 10 other children. I believe that abortion is murder, but the church in America can’t shout about abortion legislation without putting foster care and adoption in that same conversation. If you watch her message at Urbana 2015 and think that she’s “blaming white people” or promoting hate of some kind, then I’m sharing all this to let you know from my personal experience that Michelle Higgins loves White folks. Her life is a testimony of the reconciling power of the Holy Spirit to break down the walls of division. In my 20 years of knowing her, she has been a compassionate and prophetic voice to both White and Black folks (and more). I deeply respect her for being willing to say things that will get criticized. I’m not too comfortable even writing this endorsement because of the flack that I might get! But we need prophetic voices to say these things and not flinch. So, Michelle, thank you and congratulations for how God is using you at such a time as this. Following the tragic and paradigm-shifting events in St Louis, it felt necessary to look back to the Civil Rights movement and the expressions of worship that shaped the theology of righteous protest. “Keep Your Eyes on the Prize” or “Keep Your Hand on the Plow” as it’s sometimes called fit the theme. I chose to blend the lyrics of Mahalia Jackson’s recording with the more recent verses from Mavis Staples recording. Jackson’s recording focused on the more transcendent context while Staples’ recording focused on the immanent call for justice. With justice and righteousness, Your kingdom is forever blessed, You reign! Through the blood of the worthy Lamb, we worship the Son of Man, You reign! My dad wrote this song based on Micah 6:8. There’s an old Maranatha setting of that verse which has been played out since the 90’s. We also sang another setting from the “Compassion Art” project in the ‘00’s called “You Have Shown Us”. However, this new setting was inspired by the music of jazz vocalist, Gregory Porter has some very tasty changes. It’s a keeper. Michelle Higgins dug up this classic from the Hawkins song book for the 2014 LDR conference. The song touches on so many themes without losing focus so it’s a good opener, communion song, sermon prep, offertory, and more. I opted to leave out the bridge, but every time we sing it, I have doubts about whether that was the right call. Maybe you’ve heard of this song. Sometimes you have to just play the hit. Especially when it’s got good meaty lyrics. I couldn’t just play it straight though, so we’ve turned it into a Reggae feel, kind of like “Three Little Birds” and we moved the key to E flat. My friend, Dieu Teku shared this song with us. “Nkembo” means glory and each verse is about one of the persons of the Trinity. It’s fairly simple to pick up by Americans. This song was composed for the 2015 New City Music Conference. It was well received by our congregation despite the more laid back groove. I had a lot of fun writing this song, and it’s pretty fun to perform if you can hold the pocket together. There is therefore no condemnation for those who are in Christ Jesus. We are free. We are redeemed. We are heirs. We are justified. This is the message of this song composed in French by Maggie Blanchard, a Haitian singer living in French Canada. How could you not love a song with these words? Josh Davis is the founder of Proskaneu Ministry. I love how this song uses multiple languages (English, Spanish, Arabic, Korean, and Swahili) to express thanksgiving. It is based on James 1:17, “Every good and perfect gift is from above, coming down from the Father of the heavenly lights, who does not change like shifting shadows.” This song has connected well with our congregation. I have to honestly say that our band sounds great performing it. We performed this song a while back at one of the LDR conferences and I’ve been looking for a good time to perform it. In October, we were having a “Choir Sunday” and I was torn between a few different songs that we could have added. I sent an email to several Gospel music fans on my team with 4 options and asked them to pick two. They all picked this one. The message is one that we preach often here at NCF, that Jesus calls us to love the world and he has promised to supply everything that we will need to accomplish that calling. Our pastor, Tony Myles really got fired up by this song and exhorted the congregation to continue singing this song. It was a blast! We had a “Spanish Sunday” in October when we were able to teach this song. A new singer, Marcella Lee, shared this song with us. It’s a prayer of invocation asking the Spirit to rain on us with power and to restore us again. Amen! We’ve only been able to perform this once. I wrote about it a few weeks ago, so go read about it here. I wrote this song for Advent and we performed it on our last Choir Sunday of the year. It was a blast and the choir had fun learning it. I’m so thankful for the opportunity to composed music for NCF and to be able see that music become the emotional framework for the people of NCF. Please share any new songs your church learned this year in the comments or if you are from NCF, what was your favorite new song from 2015? I’ve had a few days to rest (play with my kids, talk with my wife, stare at the walls, etc.) and now that I’m back in the office, I’m ready to think a little bit about the conference we just hosted. I want to especially thank Carrie Jones, Michelle Higgins, Adina O’Neal, Lisa St. Pierre, and Sara Ward who did the bulk of the back end logistics to make the whole conference work. We had some good times playing music together and sharing our worship expressions. This year, there was a much stronger representation of original songs and arrangements. I brought some of my stuff, but there was also the creative work of Michelle Higgins, Michael Kendall, and Matthew Monticchio. New City Music is becoming more and more of a movement of original songs and expressions through the work of the Spirit in our communities. These songs came off to me as much stronger than the “radio” stuff in our times of worship. The open mic time was also full of original songs and ideas. God is moving and working in this generation, y’all. All three of the plenary sessions were fun, moving, and thought provoking. I was not at all the breakouts (i have to rest some time, right?) but I am looking forward to listening to them online. Ruth Naomi Floyd was my personal highlight. Her voice could move mountains. She has incredible control over her instrument making each “clip” of a spiritual that she presented deeply expressive and poignant. Many of the songs she shared, I’d heard before, but I’d never really listened to what the song was saying until she “unpacked it” for us. Edem Dzunu was both hopeful about the power of the gospel to reconcile people, but also didn’t downplay the hard truth that it ain’t easy. It’s always encouraging to know that the struggle that I’m experiencing is not unique to me because there’s something I’m doing wrong, but the struggle is the only path we can walk in order to see the kingdom advance. My dad, James Ward, was his usual entertaining self and I always enjoy his presentations. He’s my mentor so nothing he brought was new to me, but I was thankful that he was able to share about his rehearsal experiences with this larger audience. I am so thankful for the friendships that are born out of these events. We also grow closer and share more about each other with each passing year. I was especially appreciative of the St Louis community of musicians who stepped up to help. When we hosted in 2011, I felt like I had to “do it all” without much help, but this time, I had a team of friends who had my back and brought gifts that I didn’t even imagine were possible. I was encouraged to see people connecting with each other departing with new connections. Carrie Jones is the conference director this time. Carrie was involved in the 2011 conference we had here in St. Louis as the graphic designer and she created the conference notebook which was so full of information and resources that people wanted to get the notebook even though they couldn’t attend the conference. Carrie is also a long time member of NCF (@NCFStLouis) and as well as a highly qualified musician on our team. The conference steering committee was made up of myself (@kirkwardmusic), my dad (@jcalvinward), and my long time friend, Michelle Higgins (@fast_foodie). We went out to lunch when my dad was here in March and hammered out the rough outline of who and what will be featured at this year’s conference. I hope that you consider coming. If you are from the local region, we would love to meet you or connect again with you to be able to encourage each other in the struggle. If you are from out of town, we would to meet and connect as well and to hear what is going on in other communities. So much has happened in our nation this year that has served to break down our facades and to reveal the areas where we are divided and broken. The gospel has the power to heal communities when it is planted in soil that will let it thrive and produce fruit. Let’s live the gospel of reconciliation and justice that is available to us through our Lord and Savior Jesus Christ. If you are a singer in the choir or the praise team at New City Fellowship, please read this update about some more changes (we can’t get enough!) that I am implementing in the music ministry. These changes will take effect immediately but are always subject to revision if necessary. Basically, the plan is to eliminate choir rehearsals and the choir director position in order to replace them with “Choir Sundays” which will happen 6 times a year. Before getting into these changes, I want to give a big, “thank you” to Noelle Becker, who stepped in and took up leadership of the choir this year. She’s been doing a lot of work to plan and prepare rehearsals with spiritual sensitivity and aesthetic excellence. I also want to thank Carrie Jones, Helen Scott and Vera Parkin who have been serving as accompanists to support our choir rehearsals. Finally, I want to thank everyone in the choir who has been sacrificing so much to be at rehearsals, to serve on Sunday mornings and to love the congregation through using their voices. These changes are not an indictment on anyone’s performance, but rather, it’s time to take our collective gifts and focus them into more fruitful areas of the music ministry. As we look forward to what’s next for the choir ministry at New City Fellowship, I want to share with you what I see as our strengths and our weaknesses in regards to the vocal and choral ministries. We have many, many gifted and experienced singers in our church. Some have graduate degrees in vocal performance or other music fields, some have decades of experience singing in many different choirs and some of them are young singers with a fresh new voice to share and a passion to learn. We have willing servant leaders who give and give so much of their time to the kingdom. I see you all giving your lives away in service over and over and I praise the Lord for his righteous acts being on display in the lives of the saints at New City Fellowship. No one can ever accuse New City Fellowship members of being unwilling or selfish with their time or resources. Schedules and availability of singers has meant that we have not been able to maintain a large group (20-25) to meet on a weekly basis. We have changed the time around. We have used promotional blitzes and targeted invitations. We have opened up the restrictions to give more and more freedom for people to participate. However, last fall and well as this winter, we have averaged about 10-12 people at rehearsals. In February (what is usually one of our strongest months), we cancelled a performance for lack of people and some of our performances had to use “on mic” singers to fill in the parts that were low in numbers. Every other month (6 times a year), every singer in the music ministry would be assigned to Choir Sunday in the planning center. Also, an announcement would be made to the whole church encouraging anyone to participate. As always, volunteers are free to accept or decline, but the expectation is that every singer on the team will participate if they are available. This ensures that we will have a large, strong team of singers who are both leaders on the team as well as casual singers from the congregation. The planning center plan for a Choir Sunday would go up several weeks in advance with the 4 songs before the offering designated as “choir led.” Songs will be mostly pulled from the weekly repertoire of worship music at NCF and a song or two would be from our choral repertoire. Participants who accept the assignment can access recordings, sheet music and part-specific demos in order to prepare on your own for 3-4 weeks in advance if necessary. Instead of a separate choir rehearsal, all the Choir Sunday singers would come to the 9:00am-11:00am music team rehearsal. During this time, the choir and the band would prepare the songs for Choir Sunday in much the same fashion that the music team prepares every weekend. On Choir Sunday, the singers would all arrive at 8:00am (as normal) but after the 4 choir songs in the 11:30 service, the singers could depart and I would lead the last 2 songs by myself. So, the Choir Sunday would be easier for music team vocalists to participate in than other Sundays. In our old format, we were singing 16 performance anthems a year. In the Choir Sunday format, the choir will participate in leading worship for 24 songs a year. In our old format, participation in the choir required a commitment of 1.5 hours a week, plus a 3 hour commitment twice a month on Sundays. In the Choir Sunday format, the music team vocalists would have NO additional rehearsal or Sunday commitments and non-music team singers would have no more choir rehearsals to attend and 10 less Sundays a year that they would have to commit to. Less time-commitment means more availability to participate. In our old format, the church had to pay a choir director, in addition to the music director to maintain a choral program that averages an attendance that is smaller than most of our House churches or Adult Ed classes. In the Choir Sunday format, the music director can maintain the choir operations without the need to budget for the choir director which frees up the churches resources for other use (or a little less end-of-year deficit). In the old format, singers who were not comfortable with traditional European music notation were often marginalized and left feeling inadequate. In the Choir Sunday format, the inclusion of congregation songs and the large choir numbers infused with song lead singers creates a safe environment for these more vernacular-style singers to be welcomed in. This moves us more in line with our core values. I would like to make our first attempt at this format on Easter Sunday next month. It might be a little crazy, but why not go crazy when we celebrate the risen Jesus? 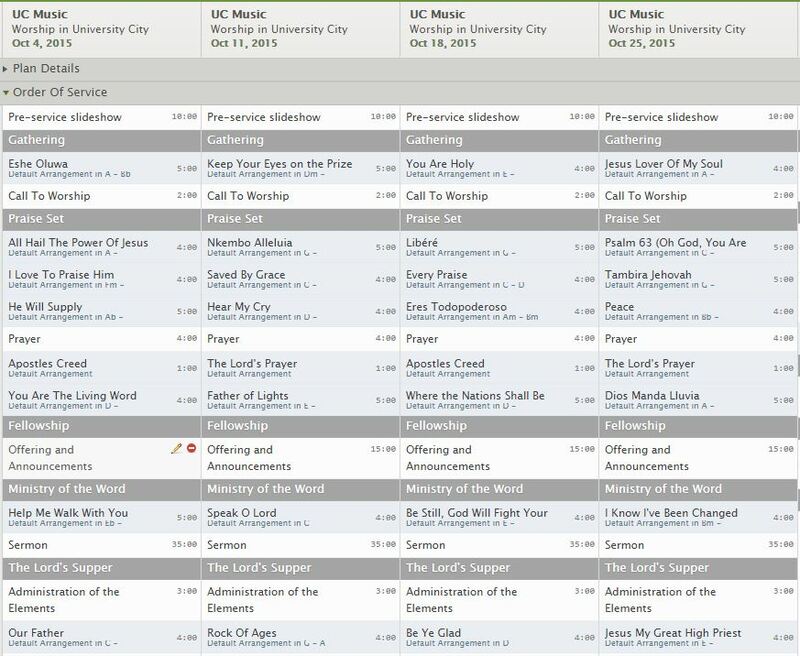 You can expect to hear more about it soon, but you can also check out my draft-plan for Easter Sunday on the planning center here: https://www.planningcenteronline.com/plans/18182697/public. So then we would have Choir Sundays in June, August, October, and December. If you have any questions about these changes, please write me an email or set up a time when we can talk. I’m open to any suggestions or ideas. Please join us for the 11th annual Black Heritage Celebration at New City Fellowship on Saturday, February 28, at 6:30. Our theme for the evening is “To God Be The Glory” based on the Andraé Crouch song, “My Tribute.” Crouch passed away last month and we will be performing a couple of his songs in the concert to celebrate God’s work through him as a composer and worship leader. In our planning, we the musicians talked about the passage from John 9 about the man born blind who Jesus healed. The question was asked about why he was born that way and Jesus’s response was that this happened that the works of God would be displayed in him. So as we remember the heritage of African Americans, we might ask “why did so much evil and suffering have to happen in our nation?” and we can look to this blind man, his healing and his testimony to see that all people and cultures exist to display the works of God, for his glory alone. We remember the past works of God in Black community and culture because HIS glory is woven into their story for all to see, and we can all praise Him for the things He has done. Please pray for the unity and bond of peace from the Holy Spirit to fill the hearts of everyone involved. Please pray for Thurman Williams, one of the pastors at Grace and Peace Fellowship who will be bringing a sermon. Please pray for the long, slow healing process that our region is going through this year. I just got back from Chattanooga and while I was relaxing with my family, I also had time to take care of some long over due meetings. I met with some of the team that curates ncfmusic.com and we are hoping to fix some of the glitches on the website as well as tweak the content to make it more useful. In addition, we were able to talk some about a music conference for 2015! If you are a church musician (volunteer or pro), you should make a general plan to travel next summer to our conference to be inspired, encouraged, empowered, etc. in the struggle to produce cross-cultural music for worship. By the way – if you are a musician in St Louis and you haven’t done it yet, please register for the Worship Music Workshop on August 8 & 9. Why: worship teams from various churches don’t normally have the chance to gather in the same place to be participate in worship events rather than direct them. We will learn together, encourage each other, and share our experiences.